The grand old city of Transylvito is the capital of Transylvito and is built atop Mount Mofo. Her signamancy tends towards gloom as this city occupies an overcast hex that never sees the sun. Trees grow gnarled and bare. Every morning mist hangs in the air, with the sky only partially clearing at night. The city is mainly accessible by air, but there is an old aqueduct trail leading up the mountain, which has a high move penalty. 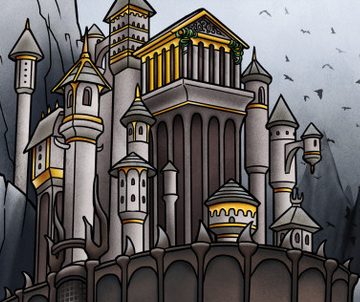 Transylvito's defenses are composed mainly of highly defended towers, built with air battles in mind. The ornamental outer wall was never intended to be highly defensive, and with good reason: there hasn't been a serious ground assault on Transylvito in thousands of turns. "Transylvito was a city that looked like you didn't want to mess with it... The black walls, marble columns and iron towers reached right up out of the black-streaked granite of the imposing Mount Mofo. Everywhere you looked, there was something sharp, something hard, something that could croak you." The city of Transylvito has four dungeons, the locker, the cellar, the tower and the hole. The city has been upgraded with a Jedlike tower called Huehue. This page was last edited on 29 July 2018, at 22:08.